After years of scrapped expansion plans, the demolition of an historic pumping station and veal warehouse, and most recently, a swanky celebrity gala--the Whitney Museum finally began construction today on its new home in Manhattan's Meatpacking District. Mayor Michael Bloomberg spoke at the groundbreaking ceremony of the Renzo Piano-designed, 200,000 square-foot museum, at the foot of the High-Line, reports the International Business Times. He joined museum director Adam Weinberg in placing the first shovels into the dirt. And on his twitter feed, the mayor remarked, "The new @whitneymuseum will be the newest world-class cultural destination in one of NYC’s most dynamic locations." Located at Gansevoort and Washington Streets, the building will provide 50,000 square feet of indoor galleries and 13,000 square feet of rooftop exhibition space, according to the Whitney's website. Since the museum opened in 1966 at the Marcel Breuer-designed, 32,000 square foot Madison Avenue spot, its collection has grown from about 2,000 works to more than 18,000. 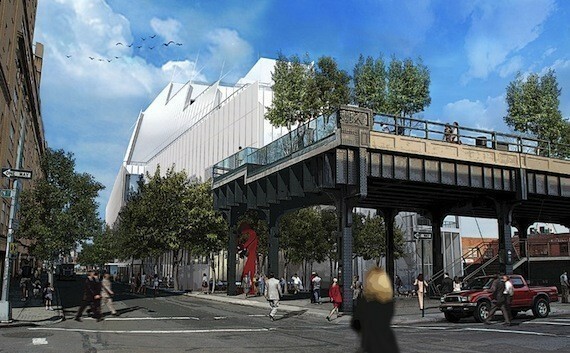 The Whitney plans to move from their current location to the MePa District in 2015 and The New York Times reports that The Metropolitan Museum of Art will then take over the Whitney's old uptown site. Construction of the new building is expected to reach a cost of $680 million. Check out this video from the Whitney's slick Groundbreaking Video Series to get a feel for the design of what will be "the largest column-free museum gallery in New York City". 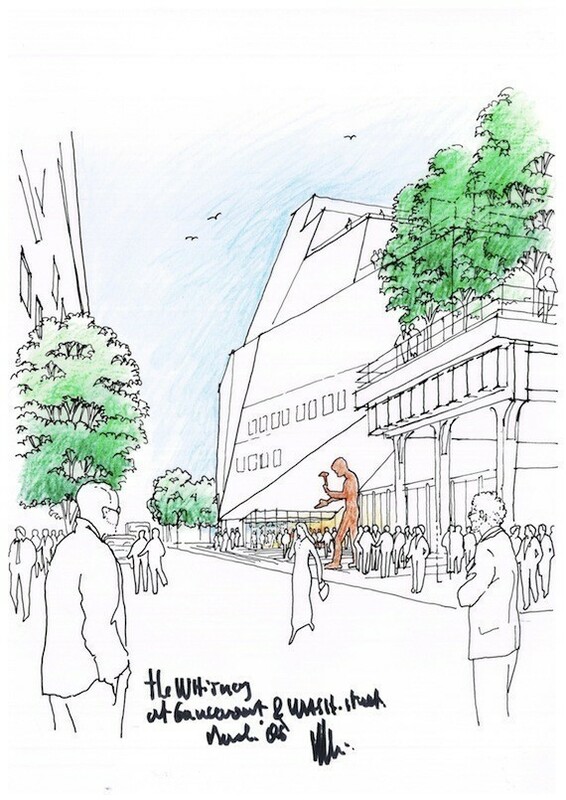 And below, see a couple renderings courtesy of Renzo Piano Building Workshop in collaboration with Cooper, Robertson & Partners.